September 2017, the convention, impacting ocean-going ves- 2016. 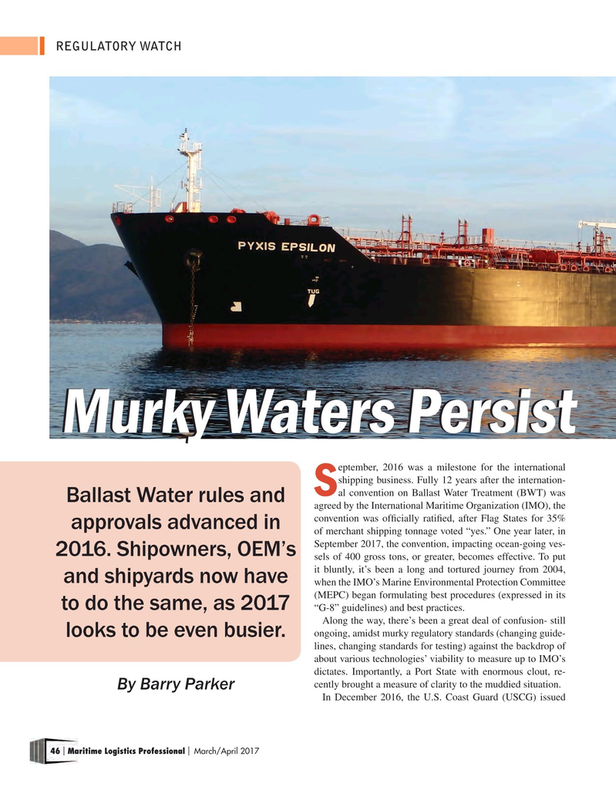 Shipowners, OEM’s sels of 400 gross tons, or greater, becomes effective. To put it bluntly, it’s been a long and tortured journey from 2004, and shipyards now have when the IMO’s Marine Environmental Protection Committee (MEPC) began formulating best procedures (expressed in its to do the same, as 2017 “G-8” guidelines) and best practices. Along the way, there’s been a great deal of confusion- still ongoing, amidst murky regulatory standards (changing guide- looks to be even busier. lines, changing standards for testing) against the backdrop of about various technologies’ viability to measure up to IMO’s dictates. Importantly, a Port State with enormous clout, re- cently brought a measure of clarity to the muddied situation.